When you’re heart is broken, you’ll do anything to fix it. Even replace it with a pig heart. Scientists at the University of Minnesota have been working on stripping down hearts, removing much of the muscular and vascular tissue. What you get is a semi-translucent “decellularised” heart. Add some stem cells, and a new heart can be grown on this scaffold. A new heart that your body won’t reject, at least in theory. When Singularity Hub first brought you this story last year, researchers at UM were using the technique on rat hearts. Now, they’ve moved on to pig hearts and we’ve got a hold of some cool new pics and a short video from New Scientist. Check them out before and after the break. At top, a rat’s heart is decellularised until it becomes a scaffold. Stem cells from mice are then applied to the heart, and it is recellularised at bottom. Photo courtesy of University of Minnesota. The ultimate goal, as you would guess, is to radically increase the availability of hearts for transplant in humans. 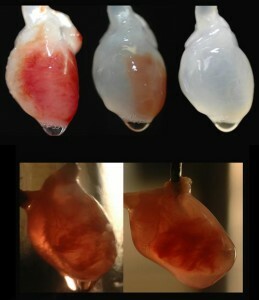 While pig hearts provide a good scaffold, we may see human hearts (from cadavers) as the finalized product. 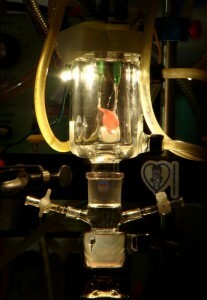 Similar techniques are being used for livers, kidneys, and lungs. Using a patient’s stem cells, and either pig or cadaver scaffolding, doctors may be able to “grow” organs for transplant. Organs where most of the cells share the same DNA as the patient. It’s the ideal situation. But we are years away from that case at the very least. The University of Minnesota first released information on their research on rat hears back in January 2008. Eighteen months later, and we’re just now seeing pig hearts in various stages of decellularisation. If and when recellularized pig hearts can be transplanted into pigs and keep them alive (the test already passed with rat hearts) we may hear talk about starting human trials. Judging by the slow but steady progress so far, this may be three to five years away. Fortunately, heart transplant patients have some experience with waiting and hoping.